The 2018/2019 Atomic Hawx Ultra 130 S was tested in the men's All-Mountain narrow category at Silver Mountain Resort by the experts at America's Best Bootfitters, powered by Masterfit. 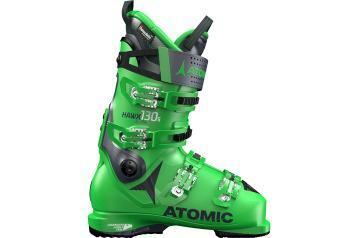 In its third annual boot test appearance, the venerated Atomic Hawx Ultra 130 S returned and reminded testers why it's been a favorite—so light and so snug, with surprising toe room in such a compact package. 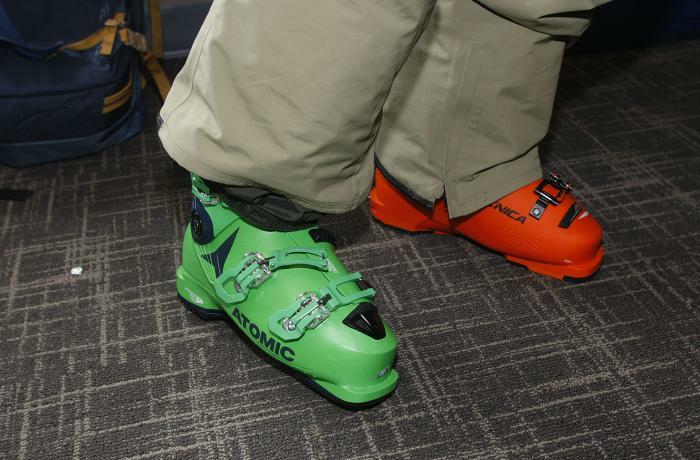 Super-charged power and snap characterize this unique All-Mountain narrow's on-snow M.O. This year's cuff is made with thin-shell-wall TrueFlex polyurethane rather than Grilamid, and the liner interior is updated with a velvety fabric that lets you slide in but holds the leg well. We tested the new (very) green paint job, which many liked, while others liked that last year's color way is still available. The boot sole length (BSL) of the Hawx Ultra 130 S is shorter by 5 mm than average and yet it fit as roomy in length as the rest of the group and might even sport a little extra width for the toes than most narrows. The Hawx Ultra Progressive Shell design leaves plastic thick where needed for support and stability but thins it out where better wrapping is required—this reduces weight and opens up some bonus interior room. Incorporated with the thin and feely Memory Fit 3D Platinum liner the Hawx Ultra 130 provides a locked-down fit from the midfoot to heel and up through the cuff while maintaining an open toebox. The feel against the leg was a little tall with an elasticized flex feel that gripped the calf firmly but without a pinch, testers said. Several testers mentioned that it's still not the easiest on and off. That snappy flex feel that testers noticed indoors translated to rapid-fire edging moves and loaded-up, slingshot-style, rebounding transitions on snow. The thin-walled polyurethane cuff wraps the leg shaft and gives a skier two joy-sticks for driving skis in all directions with no-delay transmission of movement. The switch to polyurethane gives the thin, springy cuff a little more dampness and gravity than before, which testers liked. The Hawx Ultra 130 S put skis of all widths on a rail and drilled turns at all speeds in all terrain. A few bigger, taller guys said they could over-power the cuff during Flintstonian flexing, but generally it held up to normal all-mountain abuse. The thinned-out shell wall in the lower boot and cuff gives the boot a noticeably light feel, which combined with the snug fit translated into serious agility, testers agreed. The Memory Fit shell molding feature allows a skier to oven-cook the boot, wear it for a couple minutes, cool it down and enjoy a more personalized fit. Most of our testers liked the out-of-box fit just fine, however. The Hawx Ultra 130 also comes with slate of handy stance-alignment options, from lateral cuff adjustment, to the Power Shift forward lean and flex adjustment (which accounts for the "S" in the model name), to an option on canted sole shims in 0.5- to 3.0-degrees in half-degree increments—bootfitters approve!